Scibor unveils their August promo miniature: The die bearer. Summer 2012, we have another promotion for all our clients! 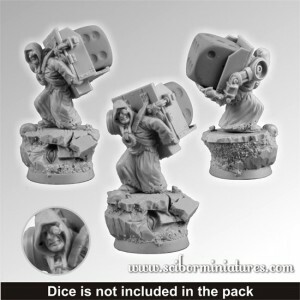 To every order for minimum $50 (without shipping cost) placed and paid until the end of August we will add our promotion SF Miniature of Dice Bearer. In blister You’ll find one resin miniature and one 25mm round scenic base. You may also buy this miniature in 28mm SF miniatures section.